Awwww, what a little cutie pie! I bet she is fluffier and softer then the pillow! 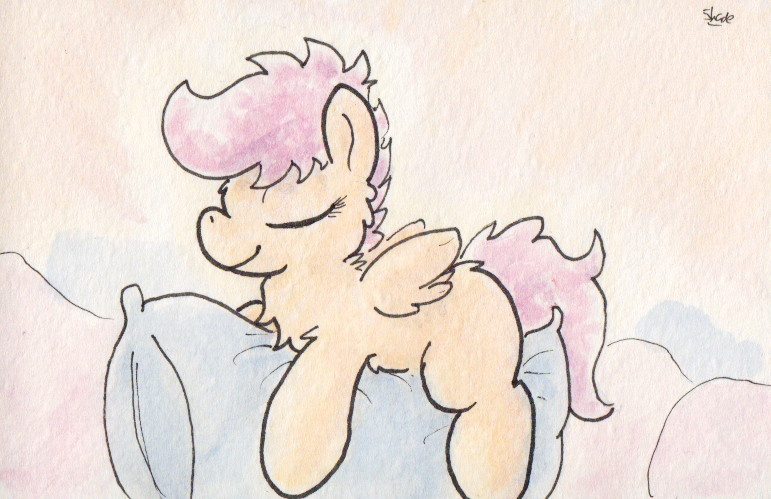 Heeh, Scoots' is a fuzzy filly! Man this reminded me that I'm tired to death... all the time. Cute! And I had a Rainbowdash Plushie from Build-A-Bear Workshop. I do think that a lot of cats demonstrate pegasus-ponular habits! Like, y'know, flapping. And.. uhh.. fluffing clouds. I do think that a lot of cats demonstrate pegasus-ponular habits! Like, y'know, flapping. And.. uhh. Oh yes, my cat is always flapping in the middle of the night.